Samsung has launched its second attempt at making this do-all device, the Windows 10-powered Galaxy Book. The Book also adds a number of improvements over Microsoft’s Surface Pro, and addresses some of the issues that the TabPro S had, such as its uneven performance. But at the same time, the Book has problems of its own that prevent it from being the ultimate tablet-slash-laptop. The Galaxy Book line seeks to rectify design and hardware flaws that kept the Tab Pro S from achieving true hybrid greatness. The end result is a compelling-looking alternative to the Microsoft Surface that could be the ideal choice for general office workers and students to creative types looking for a lightweight doodling or photo-editing station. There are two versions of the Book: a 10-inch Wi-Fi-only model that starts at $629.99 and a 12-inch version that comes in Wi-Fi and LTE flavors for $1,129.99 and $1,299.99, respectively. Both models come with a pen and keyboard in the box, which is something Microsoft and Apple charge extra for with their tablets. As with most Samsung devices, the best part of the Book is its display. The 12-inch model has a HDR-capable Super AMOLED touchscreen that’s sharp and vibrant with good contrast and lovely black levels. It’s a 3:2 aspect ratio with 2160 x 1440 pixels, which make it better suited for doing work in a landscape orientation than reading in portrait mode. The brightness adjustment goes from fully bright to unreadably dim in just a few steps. There’s also Samsung’s comically dated spinning 3D text screensaver that kicks in after just a few minutes and can’t be disabled. 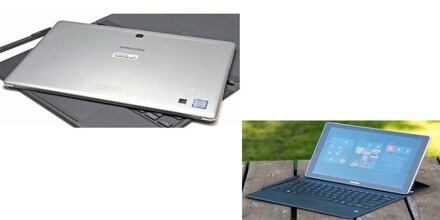 The Samsung Book is available in a few different versions. First of all it’s got a 12″ Super AMOLED full HD+ (2160 x 1440 pixel) screen and a 7th generation Intel Core i5 7200U dual core 3.1 GHz processor. Users have also got 8GB of RAM, 256GB SSD storage, a 13 megapixel rear camera, and a 5 megapixel front camera. By the way, 203GB of free space is available on the 256GB SSD at first boot. 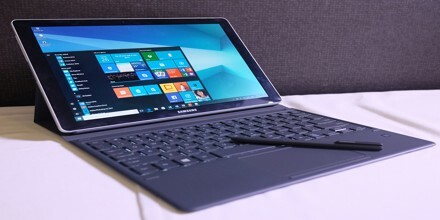 There’s also a smaller version of the Samsung Galaxy Book with a 10.6″ TFT 1920 x 1280 pixel screen and a 7th Gen Intel Core m3 dual core 2.6 GHz processor. That version is available with 4GB of RAM and either 64GB or 128GB eMMC storage. It also only has a 5 megapixel front facing camera (no rear), and only 1 USB-C port. It’s also naturally smaller and lighter. The included keyboard acts as an input method, stand, and case for the tablet. The full-size, plastic, chiclet keys are closer to a standard laptop keyboard than Apple’s fabric-covered Smart Keyboard or the Surface’s slimmer design. It attaches to the tablet via pogo pins, so there’s no pairing necessary, and the keyboard doesn’t ever need to be charged. The keys are surprisingly nice to type on, with good travel, spacing, and feedback; they even come with a backlight. The trackpad is also responsive and easy to use it supports Microsoft’s Precision drivers, so scrolling and multitouch gestures work quite well. 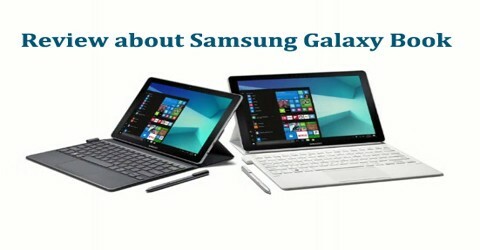 S-Pen: The Samsung Galaxy Book is the first Windows 10 tablet to include Samsung’s “S-Pen” technology that’s been widely used on the Note series of phablets. Actually, the S-Pen technology partly belongs to Wacom as Samsung licenses some of Wacom’s digitizer tech to use in S-Pen compatible screens. The S-Pen is plastic, but the clip at the end is metal, so if you want you can actually stick it to the back of the tablet or on the front bezel where the magnets are, but this isn’t terrible secure as the S-Pen will spin and dangle. Still, sticking it to the bezel makes for pretty easy access while set up on a desk or table. 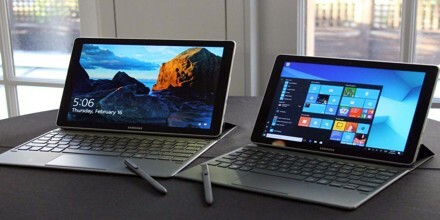 Software: The Samsung Galaxy Book comes with Windows 10 Home pre-installed. Oddly, it did not come pre-installed with the Windows 10 Spring Creators Update. Windows 10 is probably the most feature-rich operating system especially for tablet PC convertibles (AKA 2-in-1’s). Samsung also includes some special software integrated with Windows 10 on the Galaxy Book. First up is Samsung Flow. This is an app that hooks into the “Windows Hello” biometric log-in system to use a Bluetooth-connected Samsung Galaxy S6 (or newer) smartphone fingerprint reader to log-in. Adobe Creative Suite 2017 runs beautifully with the 7th generation Intel Core i5 CPU, and Photoshop does support the tilt sensitivity in the S-Pen stylus. Interestingly, it only recognizes the tilt angle when the pen tip is touching the screen. That’s different from Wacom tablets, pen computers, and pen displays which normally recognize the pen tilt angle when the pen is hovering over the screen. 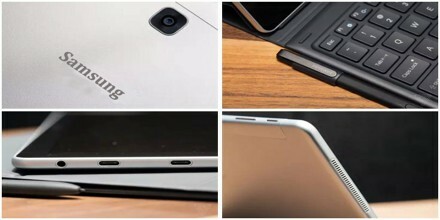 Camera: The 12″ Samsung Galaxy Book now has an improved 13 megapixel rear camera along with a 5 megapixel front facing camera. The resolution is plenty for high-definition Skype video calls or capturing something that user want to save in OneNote, but taking photos or videos with this tablet out in public is not recommended. The image quality is not so great, plus it’s a giant faux pas to hold up a big tablet in front of user to take a photo. Battery Life: Samsung claims “up to 11 hours” of battery life with the 12-inch Book, but unsurprisingly, the company’s claim and my experience differ greatly. Most days, the Book needs to be charged after just five or six hours of use as a computer. It does have fast charging through either of its two USB Type-C ports, but it still takes a couple of hours to get a full charge. The Galaxy Book is okay in a vacuum — it has a nice display, solid performance, and a comfortable keyboard — but in this surprisingly competitive field, it doesn’t match up. The PC market marches on, but this one merely stumbles.